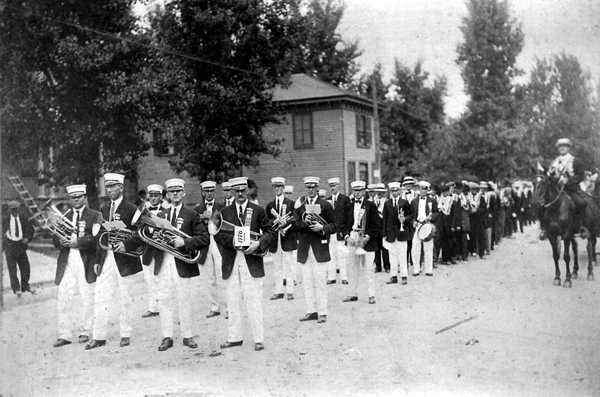 Comments: Scottsville Band prepares to lead a July 4th parade down Valley Street in Scottsville. Behind the band the Junior Order of American Mechanics (JR OUAM)can be seen lining up just ahead of celebrating Scottsville families and friends. 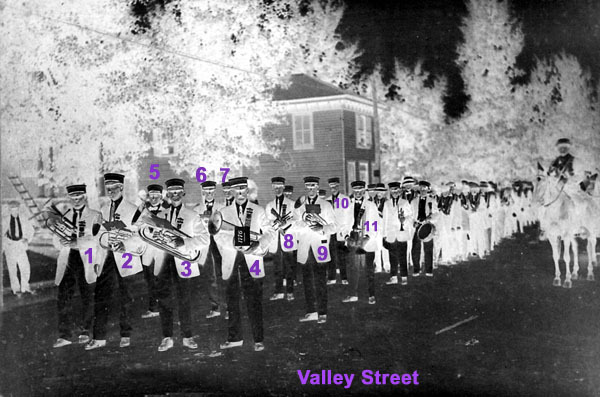 (4) Dr. Joseph P. Blair, a Scottsville dentist and member of the Town Council; (5) Grover Floyd; (6) James Londeree; (7) George T. Omohundro; (8) Nathan Sclater, twin brother of Wirt; (9) Charles B. Harris, Jr.; (10) Dr. Wade, a Scottsville dentist; (11) Paul Londeree.